So today we see from the punchstats that Jean Marc Mormeck landed a grand total of three punches against world heavyweight champion Wladimir Klitschko yesterday in Germany. You read that right: THREE. 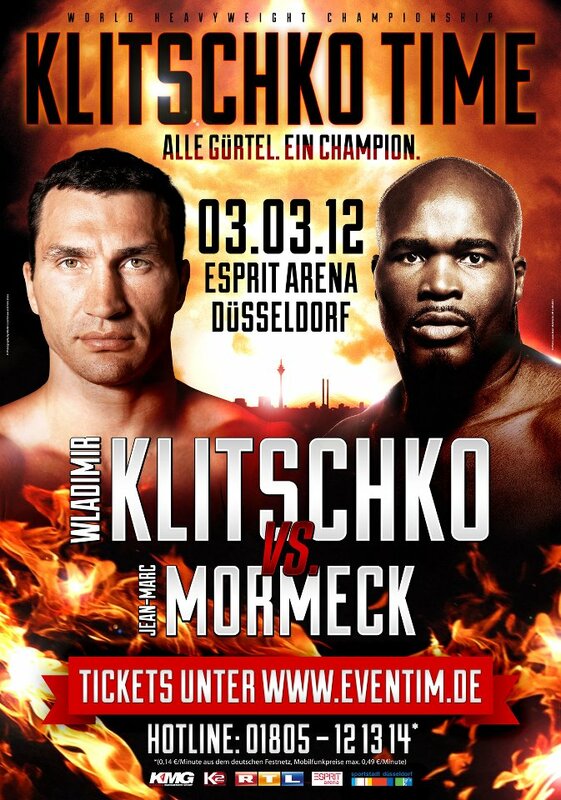 I’m not going to criticize Klitschko’s actual performance against Mormeck. Contrary to the spin put out by Klitschko and his trainer Emanuel Steward before the fight, the champion obviously knew that if he failed to blow out his overmatched opponent, his reputation would take a severe hit, and the questions from the boxing press would be annoying and never-ending. With that in mind, Wladimir proceeded to demolish the hapless Frenchman. I have no qualms with Wlad’s performance. He demonstrated his total superiority over the barely present Mormeck in every area. But I do have to wonder when he and his camp claim there was nobody better than Mormeck out there ready and willing to fight. Take the case of New York’s Monte “Two Gunz” Barrett, for instance. True, Wladimir had beaten Barrett back in 2000, but Barrett has changed his life around since those days, and has a newfound focus and commitment to his sport. This was showed in his two great efforts against David Tua that resulted in a controversial draw in 2010 and a unanimous decision victory in 2011. Last year, when Barrett went to New Zealand and beat David Tua in his own backyard, the fight was supposed to be the one to set Tua up for a title shot. – in fact, Tua’s promoter Cedric Kushner was livid after the bout, as a lucrative deal that he had in writing for a Klitschko fight depended on a Tua victory over Barrett. By beating David Tua, you would have thought Barrett would be a very strong contender to take on Wladimir Klitschko. And Barrett was definitely ready and willing to get in the ring with either Klitschko brother. “The Klitschko girls just hand-pick opponents, and fight whoever they’re emotional with,” Barrett told this writer last December. Barrett was obviously hoping, in light of David Haye’s experiences with them, that some trash talk might get the Klitschkos’ attention, but it was not to be. He was passed over in favor of the vastly inferior Mormeck. And Barrett is not the only one who would have been preferable to Mormeck. Writer Scott Christ published a list of fighters he would have preferred to see Wladimir in with compared to Mormeck, and I can’t really argue with any of his choices. 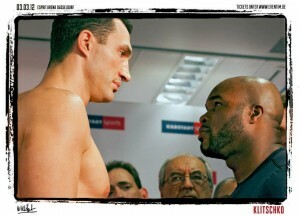 Hell, even Wlad versus the hulking giant Tye Fields would have been more interesting from the mere standpoint of size. For those who think I’m being too hard on Wladimir, who I’ve defended numerous times in the past, think back to your reaction when, after he had defeated Audley Harrison in a farcical bout, then WBA heavyweight champion David Haye floated the idea of a rematch with Mormeck, who he’d already knocked out. 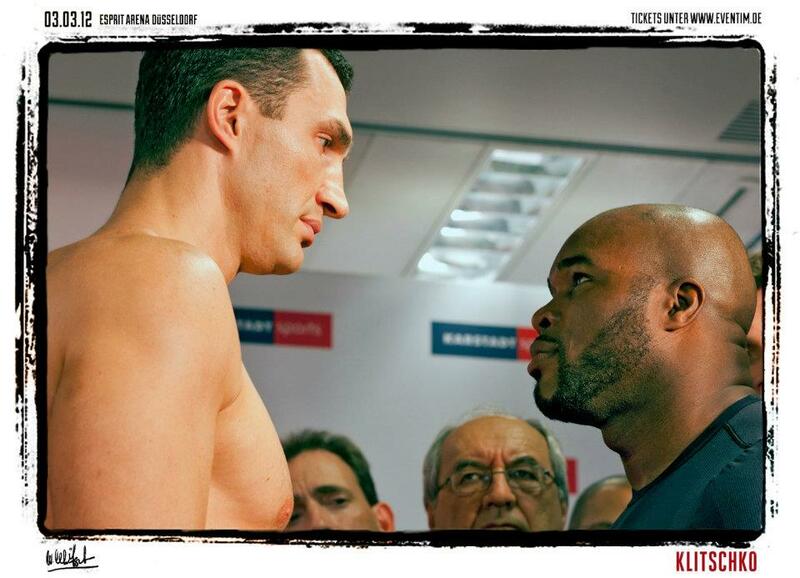 The reaction I heard from most Klitschko fans was one of outrage and disbelief. How could David “The Ducker” Haye consider such a fight? And that reaction was the correct one. In reality, Haye had no business fighting Jean Marc Mormeck at that point in time. And neither did Wladimir Klitschko this time. After being coy about his strategy leading up his title defense against Jean Marc Mormeck tonight in Dusseldorf, Germany, world heavyweight champion Wladimir Klitschko promised his German fans—50,000 of them in the arena alone—via a prefight video that he would now get his 50th knockout as a professional. Perhaps in response to the negative tone of some of the prefight chatter heard in the boxing press, Klitschko was focused and aggressive right from the start. It was soon apparent that Wladimir was determined that he would not be answering any queries at the post-fight presser as to why Jean Marc Mormeck was able to do so well against him. The French challenger tried to bob and weave a la Dereck “Del Boy” Chisora versus Wlad’s older brother Vitali, but lacking Chisora’s strength and firepower, it was a doomed strategy. 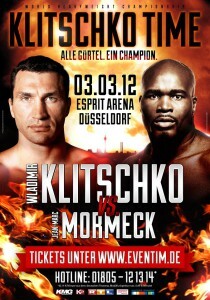 Klitschko continually strafed Mormeck with his patented power left jab, a punch which for him is an offensive weapon. Mormeck almost immediately was forced into survival mode. Mormeck was already in big trouble in round two, when he was sent the canvas from a powerful Klitschko right hand, but on this occasion he beat the count and saw out the round. Wlad was manhandling Mormeck in a sloppy round three, pushing him around the ring with ease. Three rapid-fire left hooks saw the challenger reeling, and he and the champion got their feet tangled, going to the canvas in a heap. The end came for Mormeck in round four, when Klitschko put together a vicious left-right-left combination to Mormeck’s head, sending him to the canvas for the final time. He was counted out by referee Luis Pabon at 1:12 of the round. The fight brought a satisfying close to three straight weeks of exciting heavyweight action, with Wladimir Klitschko (57-3, 50 KOs), delivering his promised 50th knockout to the adoring crowd. Klitschko named British heavyweights David Price and Tyson Fury, along with WBA “regular” champion Alexander Povetkin and Seth Mitchell, as possible future opponents. But it is former Vitali victim Cristobal Arreola who Wladimir has his eye on next –hopefully at a venue in America. “He’s done enough to deserve a fight against me,” said the champion of Arreola, who has rebuilt his career following his loss to Vitali in 2009. After this dominant showing by Wladimir, it seems that Arreola–and anyone else who challenges the champion–will definitely have his work cut out for him. World heavyweight champion Wladimir Klitschko tipped the scales at a ripped 244.7, while French challenger Jean Marc Mormeck came in at a very fit 216.1 pounds today at the weigh-in for their title bout tomorrow night. EPIX and EpixHD.com will screen the fight beginning at 4:30 p.m. ET / 1:30 p.m. PT, live from ESPIRIT Arena in Düsseldorf, Germany, where a sold-out crowd of 50,000 boxing fans is expected. Wladimir Klitschko and Jean Marc Mormeck conduct public workouts ahead of their fight this weekend. Jean Marc Mormeck of France utlizes the latest training methods to prepare for Wladimir Klitschko.